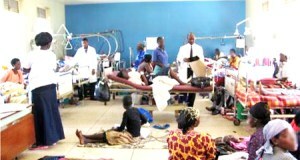 Abuja – In an effort to ensure better health care delivery in the rural areas of the country, the Federal government has introduced Community Health Influencers, Promoters and Service Providers (CHIPS), Executive Secretary , National Primary Healthcare Development Agency (NPHCDA), Dr Faisal Shuaib has said. According to him, about 200,000 CHIPS will be employed and trained in medical skills to render first aid treatment on women and children before referring them to the hospital in case of an emergency. He made this known at the inaugural quarterly media interactive forum with Civil Society Organisations (CSOs) and development parterners to chart a way forward on primary health care system in Nigeria. He said that the agency needs people who can work in the localities where they are well known and trusted. According to him, “The Community Health Influencers, Promoters and Service Providers that we are talking about are not doctors. He explained that the Community Health Influencers, Promoters and Service Providers are going to be a cadre lower than the Community Health Extension Workers who have abandoned the rural areas to live in the urban areas. He however, noted that they would be made to stay closer to the households and treat simple conditions and offer first aid services to women and children in the rural communities. Earlier, the Coordinator of CHR, Dr. Aminu Magashi Garba, said the forum would not be a one off event as it would be held on quarterly basis. He said that the forum tagged #OpenNPHCDA is aimed at promoting accountability and transparency in governance. According to him, the purpose of the meeting is to ensure that government agencies are open, transperant and accountable. “We are unlocking the agency to have a robot quarterly interactive dialogue”.